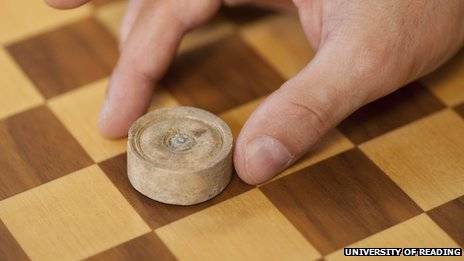 It was found in the remains of an Anglo-Saxon royal hall where board games were traditionally very popular. The Lyminge piece, which is the first to be found in a "gaming setting", includes a central bronze rivet. Common board games of the time were latrunculi and tabula, the aim of which was to capture the opponent's pieces. Both came to England in the 5th Century during Anglo-Saxon migrations. The find, which has been called "wonderfully evocative", really makes you wonder what life was like in 7th century England, and how board games fit into people's lives. Was gaming an everyday occurrence, or was it reserved for special occasions? Was it a family activity, or solely for adults? How were the game pieces crafted? At what cost? Image courtesy the University of Reading.